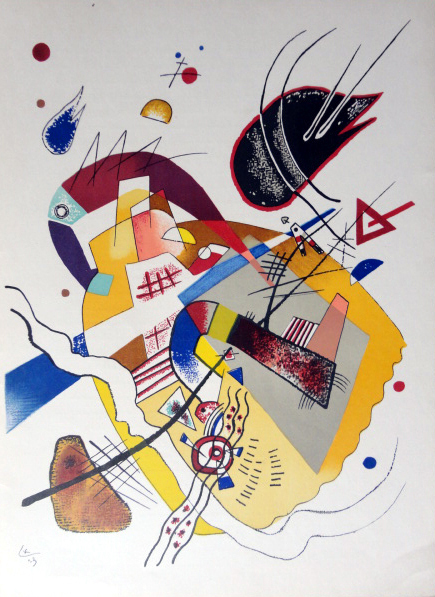 Wassily Kandinsky, cover, colour lithograph reproduced from original watercolour, single sheet, 38 x 28 cm. DLM no. 101-102-103 published in 1957 on the occasion of the artist’s exhibition of 62 paintings from 1910-1935 at the Galerie Maeght in Paris, containing 6 reproductions in colour lithographic print after watercolours by the artist. Texts by Jean Cassou “La Musique de Kandinsky” and Pierre Volboudt “Prestiges et reflets d’une création”. 150€, unframed, VAT excl., packaging and transport not incl.